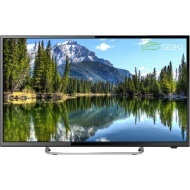 alaTest has collected and analyzed 81 reviews of Seiki SE43FO02UK 43" TV - Black. The average rating for this product is 4.8/5, compared to an average rating of 4.3/5 for other products in the same category for all reviews. Reviewers really like the sound and durability. The image quality and usability also get good feedback, but some have doubts about the reliability and remote control. We analyzed user and expert ratings, product age and more factors. Compared to other products in the same category the Seiki SE43FO02UK 43" TV - Black is awarded an overall alaScore™ of 89/100 = Very good quality. "great tv for money everything quality delivery was promt would recommend to any body"
"For the price Great and surprisingly good sound quality for a flat screen"
"Very pleased with product.Picture and sound surprisingly good. Functions on remote not so good-a bit slow and hit and miss-wonder if batteries supplied not such good quality-will try duracel. Overall a good buy and reasonable price but not a Samsung." "Quality item for the money, only negative, the speakers are not the best, but good for a second a TV"
"Excellent TV and very good value for money you cant go wrong with this TV. " "What a wonderful tv and such a good price. Great picture and sound, Grandchildren love it." "Great value, great picture, sound good. As described, not tried Ian yet"
"The price it's great! The look and quality is fantastic looks expensive. The images are crispy and really high quality. The sounds is ok you don't need it louder than 4. Good buy! Just pleasantly surprised "
"I thought the guys would have taken the box away but they didn't. Apart from that the TV is working beautifully and in would recommend it"
Seiki 55 Inch Full HD LED TV.